ADS-B for Light Sport or Experimental? In the U.S. installing a compliant ADS-B Out solution (in a certified aircraft) requires your Trig transponder to utilise a certified WAAS GPS, this provides a compliant ADS-B position source. The FAA also requires that a certified ADS-B installation is completed in accordance with an FAA STC approval (Supplementary Type Certificate). Our ADS-B STC’s are available free of charge and cover hundreds of aircraft types. 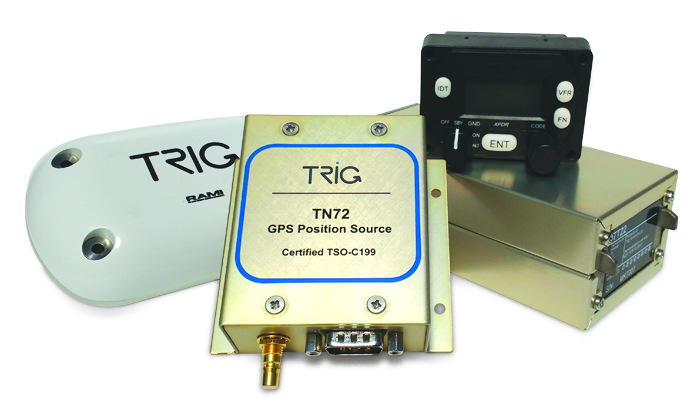 Trig STC approvals allow the use of popular WAAS GPS navigators too – making installation more practical and cost-effective. Our TA70 GPS antenna has also been added to our STC equipment list. The following WAAS GPS units are compatible and approved for use with our TT22 and TT31 transponders. July 2015 – Added Garmin GTN 600W or 700W series GPS navigators – now included in this STC for the TT31. November 2014 – A further expansion to our STC SA00744DE. This STC AML allows the use of the TT31 in 650 aircraft types. Cessna 172, 182 – TT31 with Garmin GNS 400W or 500W series, Trig TN70, FreeFlight 1201 or Accord NexNav Mini GPS. Piper PA28 – TT31 with Garmin GNS 400W or 500W series, Trig TN70, FreeFlight 1201 or Accord NexNav Mini GPS. Mooney – TT31 with Garmin GNS 400W or 500W series, Trig TN70, FreeFlight 1201 or Accord NexNav Mini GPS. July 2014 – Aircraft models and GPS position sources detailed in our initial TT31 STC AML expansion. Pitts – TT22 with a FreeFlight 1201 GPS. January 2013 – Aircraft models and GPS position sources are detailed on our initial TT22 STC AML expansion. April 2017 – Aircraft models are detailed on our TY96 STC. Customers in the U.S. should be aware that FAA, Federal Aviation Regulations (FAR) 91.227 requires that a compliant ADS-B Out solution uses a Class 1 transponder. The TT22 is a Class 1 device and meets this requirement. The TT21 is a Class 2 device and does not meet this regulation.